Intersecting pitched-roof lines add to the visual appeal of the inside & outside of this striking contemporary Lake Hickory home. Offering 3BR & 3BA, this home maximizes lake views & offers comfortable interior & exterior living spaces. 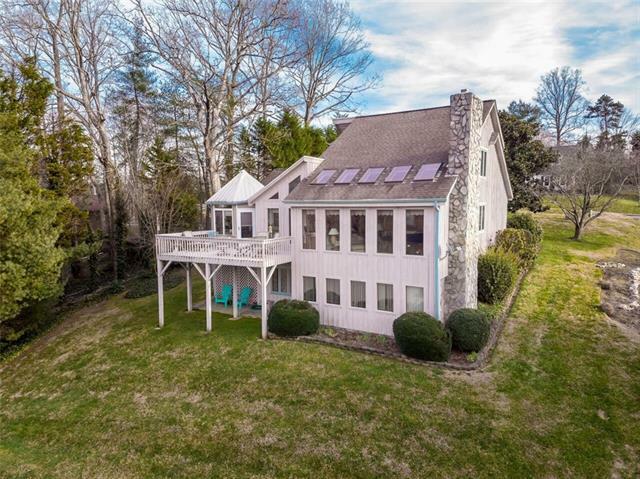 Main lvl features a lakeside GR w/vaulted ceiling & gas-log FP, eat-in kitchen w/garden window, granite counter-tops, stainless appliances, tile back-splash & pantry, large BR & full BA w/dressing space. An expansive deck & screened-in gazebo overlook lake. The second lvl of the home offers a second large BR w/walk-in closet & private en-suite BA w/jetted tub & separate shower. A den w/gas-log fireplace, BR, full BA & second kitchen complete the lower lvl living spaces. An attached main lvl 2-car garage w/floored attic access offers plenty of storage space. Located on a gently sloping lot w/lakeside tanning deck & floating dock in place. Located within walking distance to the community access area w/paved parking, covered picnic area, boat ramp & pier. Agent Owner No Community Features LakeRecreation AreaOther Construction Status Complete Financial Info CashConventionalFhaVa Hoa Fee 140.00 Hoa Fee Paid Annually HOASubject To Required New Construction No Residential Type 1.5 Story/Basement Sewer Septic Installed Special Conditions None Water Public Water Zoning Res.